Experience the west coast by kayak! If you have previous kayak experience and would like to do a day tour with kayak this is the way to do it. Start with your own or rent a kayak at our main kayak center in Grönemad, Grebbestad. We also have kayaks at Ekenäs, Koster and Rossö in the middle of the Kosterhavets marine national park. From our main center in Grönemad, Grebbestad we offer self guided and guided tours, camping tours, courses all year around, each season with its own unique charm. Just outside our kayak center you will many small and larger islands that offers shelter from the open sea and nice cliffs and bays to explore. You can launch from the beach and get straight out into the archipelago without having to cross much traffic since we don’t have any big harbors here. 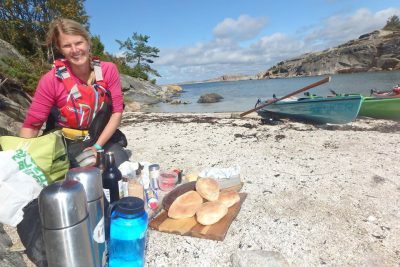 Once you have launched the kayak we recommend heading west towards Gåsöarna (Gees islands) and explore the steep cliff between north Gåsö and Gåsöhumpen. The steep cliff is about 10-14 meters and every now and then there are some brave guests that takes a plunge into the big blue ocean below. Now head south between St Kännskär and Södra Gåsa och aim for Solust and the oyester bank on the north east side of Pinnö. The crossing can be a bit challenging and offer bigger swells but once you reach Pinnö you get great shelter again. At the small island you will find a outdoor toilet. Here is a great spot to have a break perhaps take a cup of coffee and picnic. Once the break is over we recommend snorkeling and enjoying the clear, crisp water and explore the life under the surface Please note that the oysters belongs to the property owner and is not permitted to collect. If you would like to taste oysters and learn more about our world famous oysters we recommend a guided oyster tour. Now you can head back to the kayak center in Grönemad, Grebbestad or continue and paddle around Otterön before heading back. 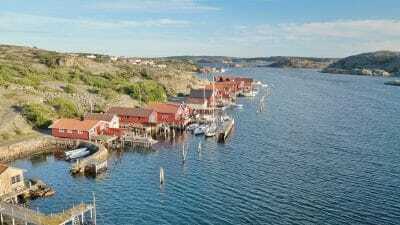 The way back to Grönemad from Pinnö is mostly sheltered and you follow the coastline and enjoy the red and gray boathouses, fishing boats and the coast life that is ongoing on the shoreline. From Pinnö oyster bank head south towards Otterön. 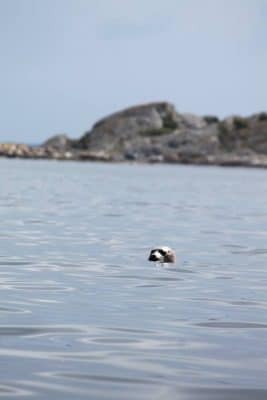 If you are lucky you might spot a seal or two around Testholmarna. Please keep an respectful distance and to the animals and respect the periods when they have cubs, dates showed in the map. This is also where many of the boats from Grebbestad head out into the archipelago to stay out of the main section and stay close to islands and shallow water where to boats cant and wont go. The majority of Otterön is nature reserve a great variation of vegetation, animals, cultural and historical relics. You might spot a mufflon as well as cows an rare orchids. It is allowed to visit the island but not camp or make fires. On top of the mountain on Stora Måkholmen you have a great view into the horizon in west were the sun sets in the summer, the weather islands south-west and on the middle or the island you will find a rock maze. It is many birds on this lovely island so watch your step when to walk the island. 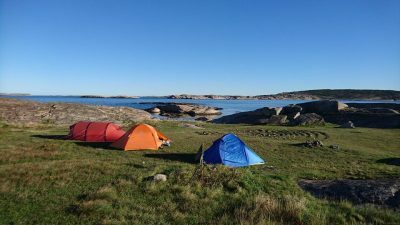 This is a great place to set camp but remember that the weather changes quickly and now you are in the outer archipelago and more exposed to wind and waves. Heading south from Stora Måkholmen takes you to Musön. From the water you will see piles of rocks on the mountain ridge on Musö. If you head south you can enter Musö-sältan inside Björnåsen. Here are great camp sports, Ormudden, Musö, Stora Brattholmen, Lilla Brattholmen, that gives you shelter in most wind directions. We are also happy to let you know that we have a project named Hållbar Skärgård that have established outdoor toilets on Stora Brattholmen and maybe Musö in the future. Now you are back in the more protected inner archipelago closer to the coastline. To complete the circle you now head north. If you crave an ice-cream or visit to a restaurant you will first pass Tanumstrand resort followed by Grebbestad with it famous boardwalk full or restaurants, ice cream stands and shops. After Grebbestad head for the lighthouses on Svinnäs on the north side of Grebbestad inlet. 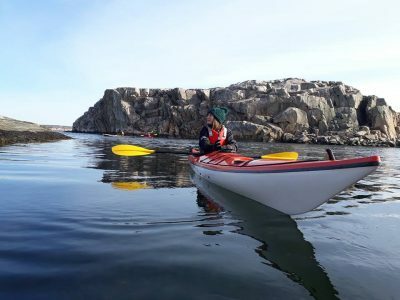 Follow the coastline on the inside of Lökhholmen, Porsholmen, Bastholmen and soon you are back at the beach in Grönemad by our main kayak center where you started earlier today.